Imperial academics have paid tribute to world renowned physicist Stephen Hawking who has died at the age of 76. The year before he visited Imperial to deliver a lecture on black holes and over 25,000 people applied for the 800 tickets available.Imperial conferred an honorary doctorate on Professor Hawking in July last year to celebrate the remarkable contributions he made to physics and cosmology over his 50-year career. 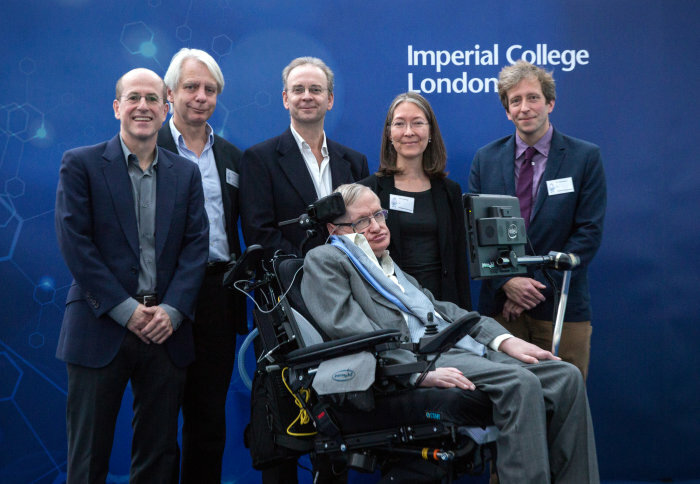 Imperial’s Department of Physics includes five professors in the theoretical physics group who completed their studies with Professor Hawking; Jerome Gauntlett, Chris Hull, Jonathan Halliwell, Fay Dowker and Toby Wiseman. One of those, Professor Jerome Gauntlett, Chair in Theoretical Physics, said: “With Stephen Hawking's passing we have lost a great scientist and a truly inspirational person. “He made monumental contributions to our understanding of gravity and the true nature of space and time. In 1974 he made the brilliant discovery that quantum mechanics implies black holes are thermal objects and radiate. "The impact of this revolutionary insight, which unites gravity, quantum theory and thermodynamics, continues to reverberate and frame research in fundamental theoretical physics over 40 years later. “Stephen had a huge impact on the world of physics and his legacy also extends to the science being carried out at Imperial. Five Professors of the Theoretical Physics Group at Imperial were all trained in Stephen's research Group in Cambridge. This training continues to underpin and influence much of the research that we carry out today. “Stephen was a great communicator and many people at Imperial will remember the extraordinary public lecture that he delivered in the Great Hall in October of 2016. “Stephen's commitment to the pursuit of knowledge at the most profound level combined with his indomitable spirit in overcoming physical disability brought out the very best in people. The world is a poorer place without him in it and he will be greatly missed." Professor Jonathan Halliwell, said: “I was deeply saddened to hear of Stephen’s death. I worked closely with him during my PhD thirty years ago and that experience has had a defining impact on my career and broader life for which I will be eternally grateful. "His scientific legacy will last indefinitely but I will remember him most of all for his spirit that knew no boundaries and for the appealing school-boy humour that lightened many a dull day. He was quite simply a remarkable human being." Professor Toby Wiseman said: "Stephen has always been an inspiration to me as a scientist. I first saw him give a talk when I was at school, already at a time when he was very famous as a physicist. "I was captivated by the audacity of the questions he was considering - how and why the universe began! He remained an inspiration when I later did my PhD in Cambridge and became a researcher in his group and now as a researcher in the field of gravitation I still marvel at the remarkable insights he had. "As a scientist he was one of a handful in the world who have really influenced and shaped the way we think about the universe and the fundamental forces. I have no doubt his scientific legacy will live on for centuries. "As a person Stephen was equally remarkable. It is quite astonishing what he achieved in the face of terrible adversity. His incredible human spirit and sheer tenacity is perhaps as astonishing as his science, and clearly has strongly resonated with scientists and non-scientists around the world. It is very sad that he is no longer with us in person, but in spirit and scientific legacy he will remain far into the future." Professor Chris Hull said: "Stephen Hawking was one of our greatest scientists and his passing is a sad loss. He made foundational contributions that have transformed our understanding of the universe. Like many people, I was inspired by his profound thought, by the clarity, wisdom and humour of his writing and lectures, and by the strength and courage with which he lived his life under the shadow of his disability. "It was a privilege to study in his research group in the exciting days when his ideas were revolutionizing our ideas of space and time and quantum theory. I particularly remember the startling impact of his revelation that black holes must lead to the loss of quantum information, undermining one of the central principles of quantum theory. "This paradoxical conflict between our understanding of black hole physics and of quantum theory was quickly seen to be a central problem in our attempts to form a quantum theory of gravity and led to heated debates that continue to this day. He was a great man who will long be remembered." 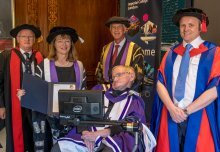 When he received his honorary doctorate Professor Stephen Hawking said: “I have always felt a deep affinity with Imperial. It gives me great pleasure to accept this honour. “Imperial has changed the way we think about the universe. Through its world-leading research into theoretical physics, string theory, cosmology, and quantum gravity, Imperial probes the boundaries of human knowledge. Professor Hawking wrote more than 250 publications, ranging from scientific papers to bestselling books. One of his most popular early works, A Brief History of Time, has now sold 20 million copies worldwide. His studies earned him a host of honours and prizes, including being named Companion of Honour to Queen Elizabeth II, member of the Pontifical Academy of Sciences, holder of The Copley Medal, the Albert Einstein Medal, the Eddington Medal, the Presidential Medal of Freedom, the BVVA Fundamental Physics Prize, and the Honorary Freeman of the City of London. At Cambridge University, Professor Hawking held the Stephen W. Hawking chair of cosmology, was the Founder of the Centre for Theoretical Cosmology, and the Dennis Stanton Avery and Sally Tsui Wong-Avery Director of Research. For 20 years he was the Lucasian Professor of Mathematics, the position once held by Sir Isaac Newton.